Stakeholders interested in reducing spending on disabilities caused by chronic disease may wish to invest in basic population health management, a new study suggests. April 05, 2017 – As healthcare providers, insurance companies, and government agencies search for more creative ways to reduce spending on public and private benefits programs, they may not have to look much further than the basics of population health management. Using population health management strategies to address the major underlying causes of disability could slash the number of Americans sidelined by serious health concerns by up to 53 percent, says lead author Neil K. Mehta, Assistant Professor of Health Management and Policy at the University of Michigan-Ann Arbor in a study published in the latest issue of Health Affairs. 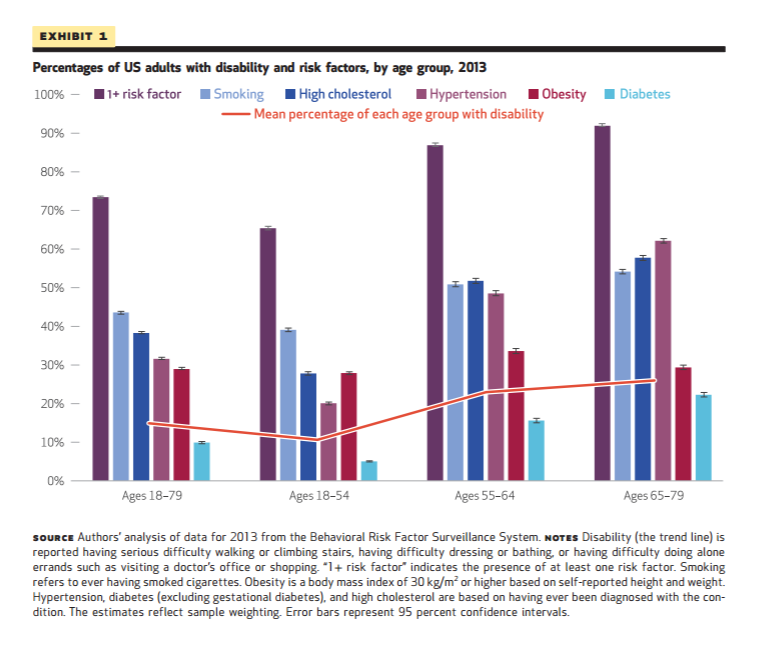 Significantly reducing or eliminating the top five modifiable health risk factors tied to disability, including smoking, obesity, diabetes, high cholesterol, and hypertension, could even help to reverse the upward trend in Social Security disability spending and lighten Medicaid spending. The Congressional Budget Office (CBO) states that Social Security disability insurance payments totaled $143 billion in 2015, supporting close to 9 million disabled individuals and an additional 2 million dependents. In 2011, state and federal Medicaid programs spent a total of approximately $168 billion on disabled enrollees, adds the Kaiser Family Foundation, indicating a significant opportunity to cut costs while improving the outcomes of those patients with preventable disabilities. Mehta and his team point out that the five top risk factors for the development of crippling chronic diseases such as COPD and serious cardiovascular disease can be largely mitigated by preventive lifestyle and behavioral changes. Healthcare providers can help patients address obesity, high cholesterol, and hypertension by suggesting improvements to dietary choices and exercise routines, while smoking cessation programs that leverage population health management techniques have been proven effective for weaning individuals off of cigarettes. In order to gauge the potential health improvements that could result from better population health, the researchers used data on close to 400,000 individuals participating in the 2013 Behavioral Risk Factor Surveillance System (BRFSS), an annual phone survey overseen by the CDC. Approximately 11 percent of individuals aged 18 to 54 reported having a disability, along with 26 percent of respondents between the ages of 65 and 79. 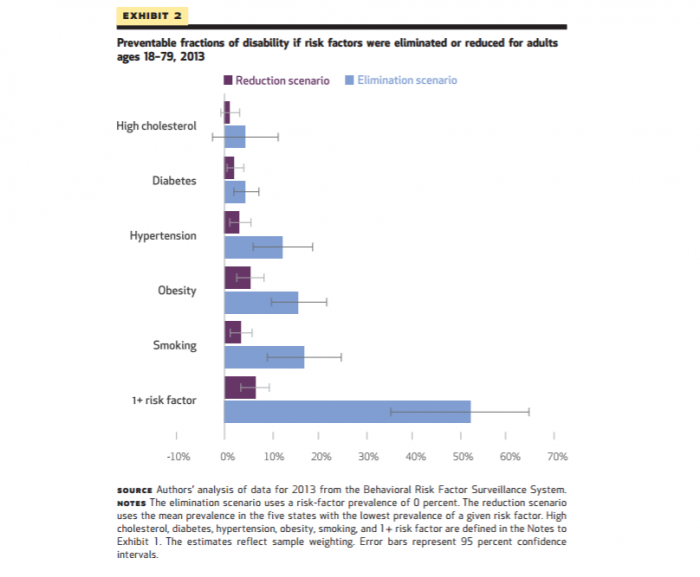 Seventy-three percent of respondents said they had at least one of the five major risk factors for disability. Forty-four percent the sample said they had ever smoked cigarettes. The researchers examined two possible scenarios: one in which the entire population had zero risk factors, and another in which all states reduced their risks to the levels of the five healthiest observed states. If all five risk factors were eliminated for all patients between 18 and 79, the level of disability nationwide would drop by 53 percent, they found. If the entire nation reduced its risks to the level of the five healthiest states, disability rates could be reduced by 7 percent nationally. Disability levels were highest in the Appalachian, Southern, and Great Lakes states, and lowest in New England and on the West Coast. Utah and California exhibited the lowest levels of individuals with at least one risk factor, at 60 percent and 67 percent respectively, while 82 percent of individuals in Kentucky and 83 percent of people in West Virginia exhibited at least one of the five major conditions contributing to disability. “Our estimates suggest that many states in these regions would experience the largest proportionate declines in disability—often in excess of 10 percent—if they reduced risk-factor levels to those occurring in the states with the lowest prevalence of risk factors,” the study says. Reducing obesity would be the most attainable goal, the study predicts, and would produce the most significant improvements to disability rates. Since obesity is tightly tied to the development of Type 2 diabetes, is one of the leading causes of physical limitations in patients, and indicates a higher risk of cardiovascular problems, healthcare providers may wish to focus on weight management programs for their patient populations.